During the course of all my music classes, I learned a lot of music theory, aural theory ( I had no idea what that was until the first day of class), and I was immersed in a multiplicity of technique classes. My one and only C in college was barely achieved in String Techniques. But I digress. I learned to read music, how to keep tempo, the different ways to play a song like staccato and legato. I grew to understand time signatures and rhythms. I learned about melodies and harmonies. All of these were and are so incredibly valuable but not more important than the other. In fact, I could read the notes on the page all day but if I didn’t know the time signature or understand the value of quarter notes and it’s relationship, it would just be random sounds without purpose. 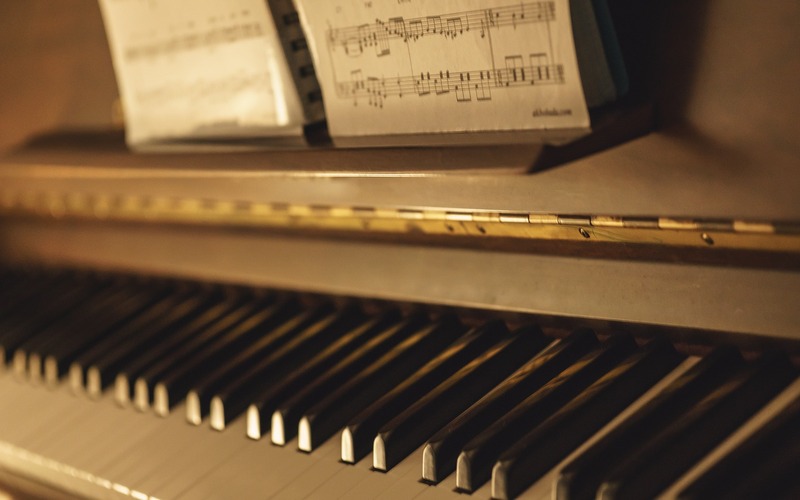 If I could play each note and keep time adequately but slurred the notes when they were meant to be clear and distinct, I could miss the point of the song altogether. Rhythm and notes and melody all working together. Then there’s the most important ingredient: the conductor. The one who knows the song inside and out. The one who has perfected the rhythm, the one who has brought together all the right people playing the instruments that best suits them. When a concert begins, all eyes are on the conductor. With a wave of his hand, the notes and tempos, and time signatures and rests and melodies and harmonies are melded together to make one glorious sound that develops in to a most exquisite symphony. Today during our MOPS meeting I had a proverbial light bulb moment. As we talked about finding rhythm in life, my definition began to morph. What I would have defined as routines and schedules, and plans and tasks was turned into something so much more. Rhythm is what keeps the song moving. A rhythm without a melody, however, is just the tapping of one’s foot. Just like a poorly played musical composition, we can become as monotonous and rigid as the clicking of a metronome if we spend too much time consumed with routine and miss the spontaneous beauty that accompanies the daily life. Granted, our lives most assuredly need a time signature and a clear understanding of the notes but as any musician will tell you: mastering the notes is just the beginning. You have to feel the music, embrace the melody, and play the song from deep within. That’s a scary place both on stage and in real life but the conductor is there to guide you! He’ll lead you in the melody if you’ll allow him that place in the busy of your life. I’ve yelled at my kids too many times today. The kitchen is a wreck and I have no idea what dinner will be. What happened to the sparkle in my eye that was so prevalent before kids? He’s there. He’ll lead you in the difficult parts of the song. Remember you are not alone. There are countless others taking their place on the stage right beside you. The conductor has a masterpiece in mind that is stunning. Music to your ears. Join me, if you will, as we let God take his rightful place center stage for the performance of a lifetime that also happens to take a lifetime. Motherhood.